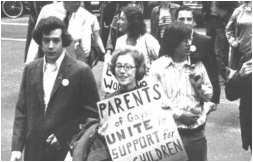 The idea for PFLAG began in 1972 when Jeanne Manford marched with her son, Morty, in New York's Christopher Street Liberation Day March, the precursor to today's Pride parade. After many gay and lesbian people ran up to Jeanne during the parade and begged her to talk to their parents, she decided to begin a support group. The first formal meeting took place on March 26, 1973 at a church in Greenwich Village. In the next years, through word of mouth and community need, similar groups sprang up around the country, offering "safe havens" and mutual support for parents with gay and lesbian children. In 1981, members decided to launch a national organization. Since then, PFLAG has grown to encompass over 200,000 members and 400 chapters across the country.